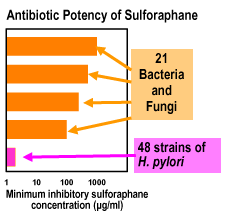 We discovered that sulforaphane is a highly effective antibiotic against all 48 strains of H. pylori tested. It is equally effective against strains resistant to the 2 antibiotics most commonly used to treat H. pylori infections in people. 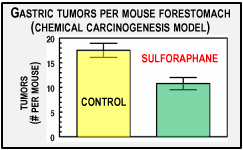 Furthermore, in mice, sulforaphane was highly effective in reducing chemically induced gastric cancer (right), and in reducing the inflammatory and carcinogenic effects of H. pylori infection (not shown). 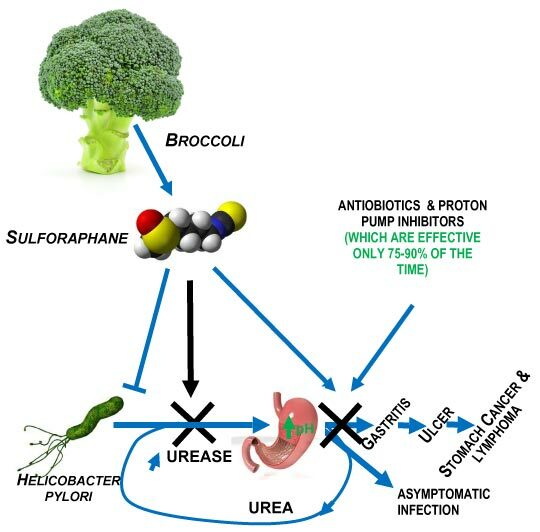 When H. pylori colonized human volunteers were fed broccoli sprouts rich in sulforaphane daily for 8 weeks, there was a significant reduction in all biomarkers of inflammation and infection, that returned to pre-intervention levels when feeding was stopped. Biomarkers were not reduced in control subjects fed alfalfa sprouts. Helicobacter is recognized as a carcinogen by the W.H.O. Infected individuals have 3- to 6-fold higher risk of gastric carcinoma.